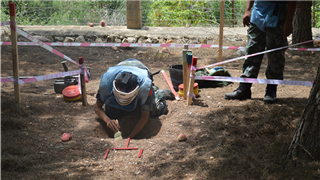 Chinese demining peacekeepers in Lebanon have shared their expertise with a foreign battalion of the UN Interim Force in Lebanon (UNIFIL) during a recent operation. Large-scale armed exchange blows broke out among refugees near the UN peacekeeping mission area in Juba, South Sudan on August 14. 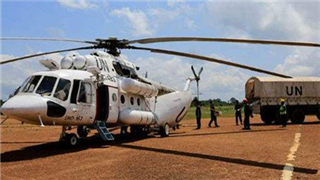 China's second peacekeeping helicopter detachment, which will be deployed to the UN peacekeeping mission area in Darfur, Sudan, was established at an army aviation brigade of the PLA 81st Group Army on Tuesday morning. 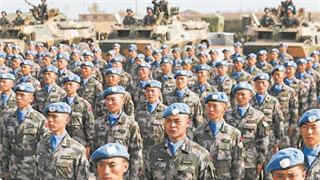 From August 1to 3 in Mali, local time, three detachments of the 6th Chinese peacekeeping force to Mali successfully passed the equipment inspection organized by the MINUSMA for the second time. 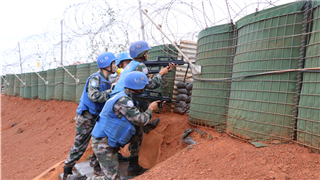 From August 1 to 3, local time, three detachments of the 17th Chinese peacekeeping force to Lebanon passed the UN equipment inspection with high standards for the first time since their deployment to the mission area. 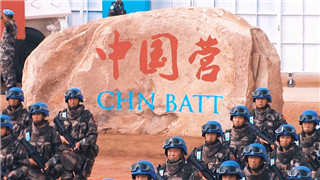 The 17th Chinese peacekeeping force to Lebanon has succeeded in building the first multi-role Controlled Demolition Site for the UNIFIL, after almost two months of hard work on the project. 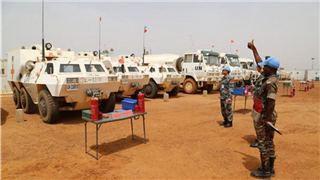 The 8th Chinese peacekeeping engineer detachment to Wau of South Sudan conducted joint defense exercise with other peacekeepers from four troop-contributing countries in the Sector West of the UNMISS in Wau on July 19. 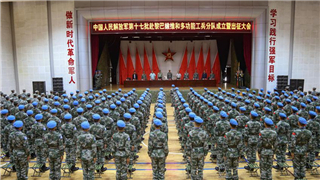 The 140 members of China’s first peacekeeping helicopter detachment were awarded the UN Peace Medals of Honor during an medal-awarding ceremony held at a camp in El Fasher, Darfur, Sudan, on July 15. 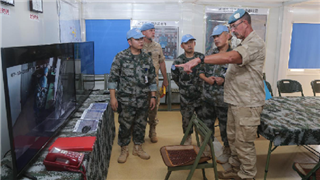 Major General Jean-Paul Deconinck, Force Commander of the United Nations Multidimensional Integrated Stabilization Mission in Mali (MINUSMA), inspected the camp of Chinese peacekeeping force to Mali in Gao on July 10. 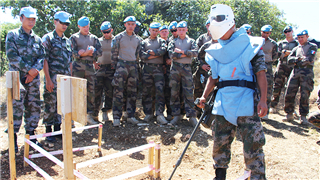 The Chinese peacekeeping troops to Lebanon greeted a French peacekeeping combat engineer detachment at a mine clearance and EOD operation site on Friday. 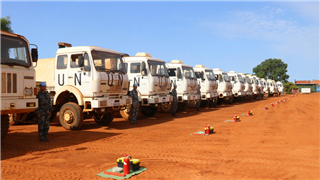 The 14th Chinese peacekeeping engineer detachment to Darfur in Sudan successfully completed a 105-km road reconnaissance mission between the temporary operating base (TOB) in Golo and the peacekeeping camp in Tawila on Tuesday. 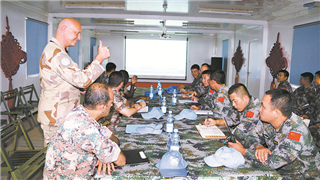 The two-week "Khaan Quest 2018" joint peacekeeping field-training exercise, participated by over 1,400 officers and soldiers from 26 countries, came to a successful conclusion in Ulan Bator, capital of Mongolia, on the afternoon of June 28. 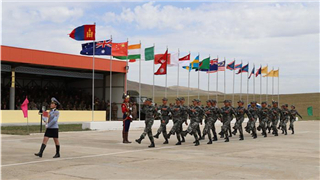 An annual multinational peacekeeping exercise, code-named Khaan Quest 2018, concluded with a closing ceremony at Five Hills Training Area near the Mongolian capital on Thursday. A four-member mid-term evaluation team sent by the China's military recently arrived at the barracks of the 8th Chinese peacekeeping engineer contingent to South Sudan (Wau) to conduct a comprehensive evaluation on the contingent's peacekeeping operations. 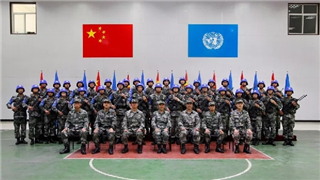 The guard detachment of the 6th Chinese peacekeeping force to Mali passed the operational capability assessment of the MINUSMA with high scores on June 19. 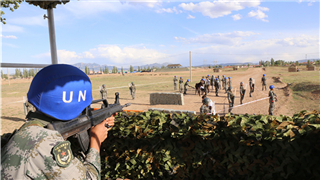 An annual multinational peacekeeping exercise, code-named Khaan Quest 2018, kicked off at Five Hills Training Area near the Mongolian capital on Thursday. 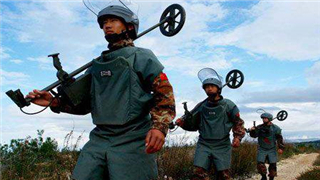 Peacekeepers of the 17th Chinese multifunctional engineer peacekeeping detachment to Lebanon came to a minefield close to the Blue Line between Israel and Lebanon on Monday to conduct their first demining operation. Thirty-five Chinese troops to participate in the "Khaan Quest-2018" joint peacekeeping exercise arrived in Mongolia on June 11. 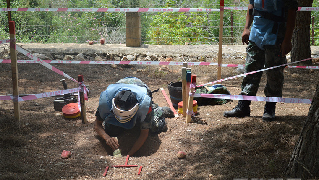 All the 70 peacekeepers in the 17th Chinese multifunctional engineer peacekeeping detachment to Lebanon obtained certifications of mine clearing and explosive ordnance disposal on June 6 after passing the examinations organized by the UNMAS. 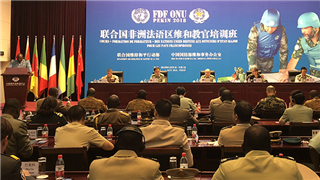 A training course for the UN peacekeeping officers in Francophone Africa was held at the Peacekeeping Training Center of China's Ministry of National Defense from May 21 to June 1. 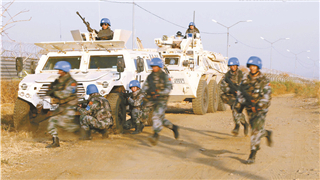 China's decades-long, steadfast commitment to UN Peacekeeping fully displays its status as a leader in maintaining world peace without favor or bias and no hidden agenda. Since joining the UN peacekeeping operations 28 years ago, the Chinese military has actively performed the responsibility of a big country. 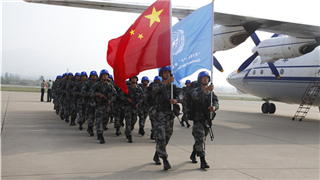 The second echelon of the 17th Chinese peacekeeping force to Lebanon, totaling 210 soldiers, arrived at the Beirut International Airport onboard a UN charter flight on May 26 and were stationed at their barracks in south Lebanon. 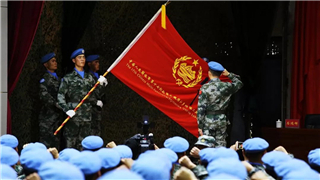 The United Nations is "very grateful" for China's contributions to peacekeeping, spokesman for UN peacekeeping, Nick Birnback, said on Friday. 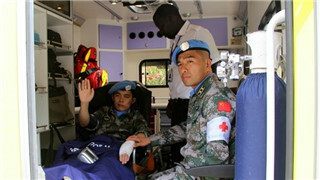 The 8th Chinese peacekeeping medical detachment to South Sudan (Wau) received a request for help on May 22. An officer of the Bangladesh peacekeeping infantry battalion suffered sudden severe chest pain during a long-distance patrol mission. 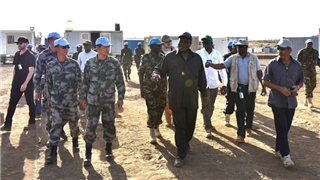 A group of 23 heads of UNAMID's sub-departments to inspect the Mission's temporary operational base in Golo, where the Chinese peacekeeping engineers had just finished infrastructure construction. Eighty-three Chinese peacekeeping engineers returned to their base camp in Nyala on May 19, local time, after completing the construction of a UN peacekeeping base in Marra Mountains. 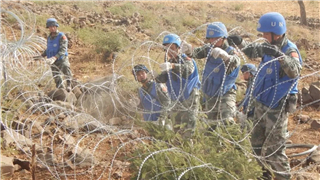 The United Nations Interim Force in Lebanon (UNIFIL) Headquarters conferred the Certificate of Appreciation on the multifunctional engineering detachment and the construction detachment of the 16th Chinese peacekeeping force to Lebanon on May 17. 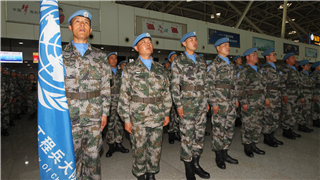 The 190-strong first echelon of the 6th Chinese peacekeeping force to Mali departed from Ji'nan Yaoqiang International Airport in Ji'nan, capital city of eastern China's Shandong Province for the west African nation on May 16. 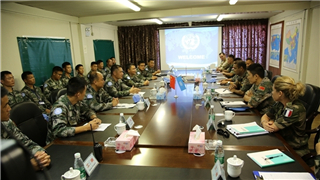 All mission personnel, including Chinese peacekeepers, are making joint efforts to strive to fulfill the sacred peacekeeping mission entrusted to them by the UN Security Council. 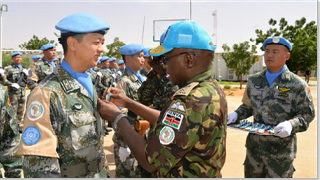 Force Commander of the MINUSMA Major General Jean-Paul Deconinck awarded on Saturday the Certificate of Appreciation to the 5th Chinese peacekeeping guard detachment to Mali to commend Chinese peacekeepers' contributions to promoting the peace process in Mali. 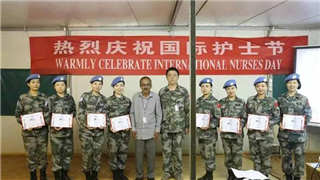 Eight nurses of the 8th Chinese peacekeeping medical detachment to South Sudan got the excellence award conferred by the UNMISS to commend the quality and efficiency of their nursing work last Friday, the day before International Nurses' Day. 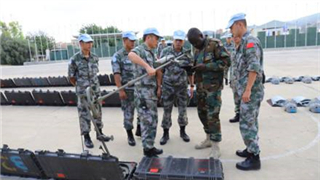 The 8th Chinese peacekeeping engineer detachment to South Sudan (Wau) passed the United Nations (UN) equipment verification on Tuesday with all the items meeting the verification requirements. 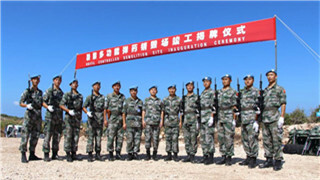 The 17th Chinese peacekeeping force to Lebanon held a grand rally to mark its founding and expedition to Lebanon Monday. 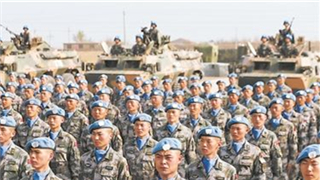 The majority of the peacekeepers come from a brigade of the PLA Army's 75th Combined Corps. 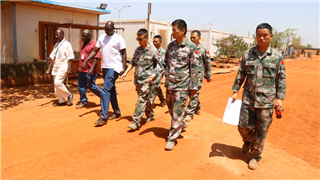 The 8th Chinese peacekeeping medical detachment to S. Sudan (Wau) has been engaged in consultations in the past few days with the Sector West Headquarters of the UNMISS. 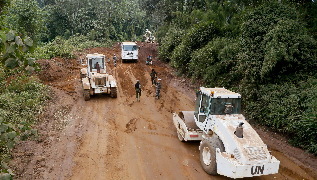 Lieutenant General Derrick Mbuyiselo Mgwebi, Force Commander of the MONUSCO, honored the 21st Chinese peacekeeping engineer detachment to Congo (K) with special awards at the closing ceremony marking the successful completion of a major bridge restoration on Apr. 16, 2018. 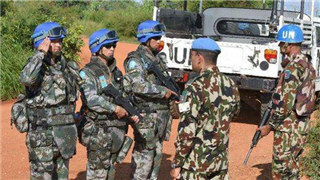 China will dispatch 395 peacekeepers in May to Mali for one year on a UN mission. China's first peacekeeping helicopter detachment to Sudan (Darfur) successfully completed air transportation of the Pakistani peacekeeping engineers in an troop rotation operation on April 15. 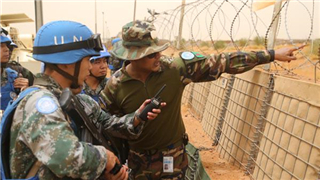 The 5th Chinese peacekeeping engineer detachment to Mali obtained an excellent mark in the peacekeeping capability assessment conducted by the United Nations Multidimensional Integrated Stabilization Mission in Mali (MINUSMA) on Apr. 12, local time. 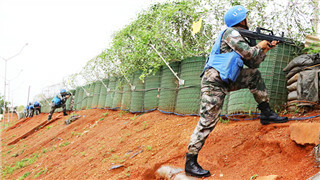 The 8th Chinese peacekeeping engineers detachment to South Sudan (Wau) successfully passed the environmental assessment of the United Nations Mission in South Sudan (UNMISS) and received the “Green Camp” title on Apr. 12, local time.